Hello from the Windy City! My name is Olivia Meiste, and I am a social work major currently enrolled in the Chicago Semester program. I was born and raised in the small, Dutch town of Holland, Michigan. After graduating from High School, I decided to move a lengthy 15 minutes down the road to Hope College. Hope is an amazing school and pushed me to grow in many ways, although only a few, short miles down the road from my parents. I spent the next three years there digging deeper into life and what it means to be a social worker in today’s day and age. Last fall around this time, I vividly remember sitting down with my supervisor to figure out internship plans for senior year. Although I wanted to stay in Holland, close to friends and family, he really pushed me to reach outside my comfort zone and consider other programs in larger, urban areas. I decided to humor both him and myself and looked into programs, such as Chicago Semester. 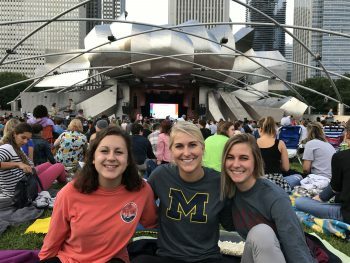 The staff members at Chicago Semester really invested their time into helping make the application and finding an internship process feel effortless. Next thing I knew, my bags were packed, and I was headed to live in a city a little further away than 15 minutes down the road. Now in Chicago, I am interning at a foster care agency called SOS Children’s Villages. SOS is a unique foster care agency in that their main mission is to keep foster children united with their siblings. To do this, they hire professionally trained foster parents to live in homes, provided by the agency. All of the homes are placed together but are also integrated within the community. I have gotten the privilege to work with and under caseworkers here at SOS. I have had opportunities to supervise parent-child visits, organize events for the kids, attend Child and Family Team meetings, or collaborate with other specialists in order to best help a child. Both Chicago Semester and SOS Children’s Villages have opened my eyes to a new side of social work and living. Although it was hard to leave my home town, I met amazing new friends and have enjoyed everything the city has to offer. I’ve been to a cub’s game, jazz festival, art festival, farmer’s markets, the zoo, and have eaten way too much pizza (but I’m not complaining). 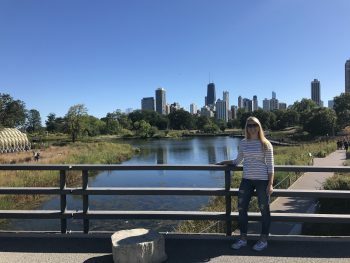 I am so glad my adviser directed me towards Chicago last fall as living and working in an urban area is an incredible experience with endless opportunities.